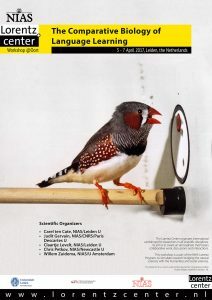 The NIAS-Lorentz Theme Group “The Comparative Biology of Language Learning” explores the evolution of language learning. The group members will carry out their intensive interdisciplinary collaboration project from 1 April 2017 until 30 June 2017. The workshop The Comparative Biology of Language Learning is held from 3 April through 7 April 2017 and identified the insights gained by human (including infant), nonhuman animal and computational studies on the topic of language learning.